I have finally slipped into a summertime-state-of-mind. With all of the busy 4th of July festivities now but a memory, I find myself yearning to delve into all that summer has to offer. I want to covet the long, lazy, steamy days and saunter through them with a moment by moment mentality. I love to rise with the sun and quietly sip that first exquisite cup of coffee before the rest of the world wakes up. As I move onto my second cup I relish in the ritual of watering my thirsty garden. Watching the cool water bring my beloved flowers back to life I make a mental check list of what I’d like to accomplish in the precious hours that lay patiently before me. More often than not, my mind wanders to food. What meals will I prepare for my family today? Nine times out of ten I visualize a meal made for the grill as the perfect way to eventually end the day. Wouldn’t you agree that grilling is the perfect way to end a summertime day? And in my mind, the less complicated, more flavorful, the better I always say. 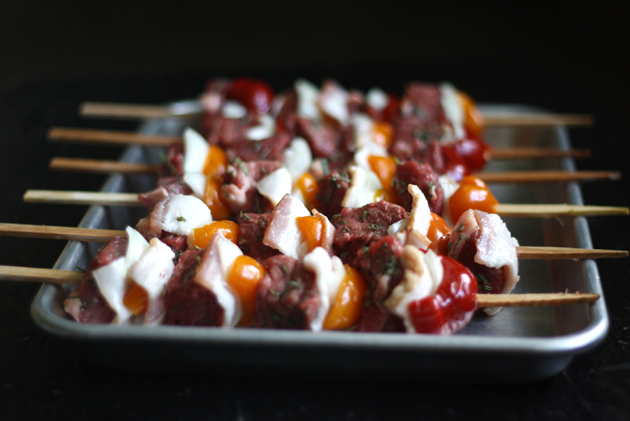 Wait until you see how easy these sweet & spicy pepperazzi steak kabobs are to assemble! You’ll need top sirloin steak, hickory smoked bacon, red & yellow jarred pepperazzi peppers, an onion, fresh sage and dried rosemary (and paprika and S & P that didn’t make it into the photo). You’ll also need some skewers. Can’t make kabobs without skewers. I used wooden hickory smoked skewers for added flavor but you can use whatever you like. (If you decide to use wooden skewers just remember to soak before using). Putting the kabobs together is a breeze. Cut the steak, onions and bacon into 2 inch pieces and pepperazzi peppers in half. 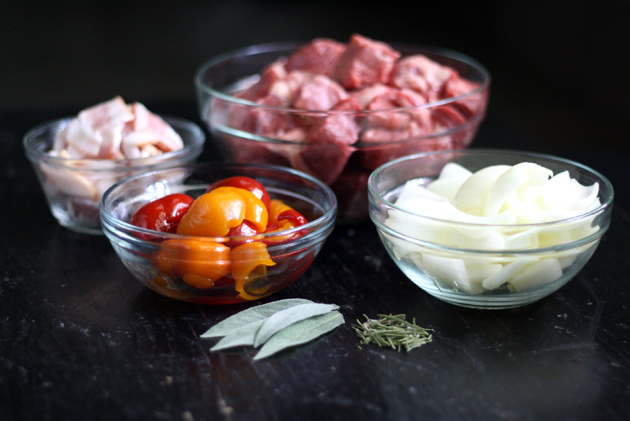 Place the steak into a bowl and toss with the herbs, paprika and some salt and pepper. Then assemble the kabobs. Any order will do, however I strongly suggest that you make sure to place the bacon against the steak for extra flavor as the two meld together while grilling. It is magnificent. Wasn’t that easy? And aren’t they pretty? Just wait until you taste how flavorful they are! Once assembled, place on the grill and cook (and turn) kabobs until desired temperature. 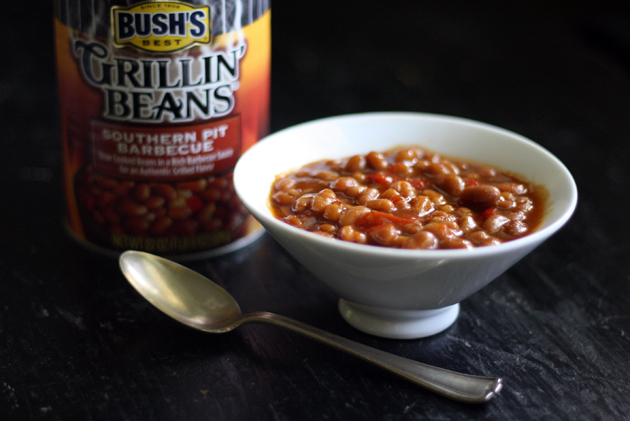 And while your at it, try throwing some Bush’s Grillin’ Beans into a grill-safe bowl and heat them right beside the steak kabobs on the grill. I like to take the term “grillin’ beans” literally. And why not? It makes dinner that much easier. I served Southern Pit Barbecue Grillin’ Beans. 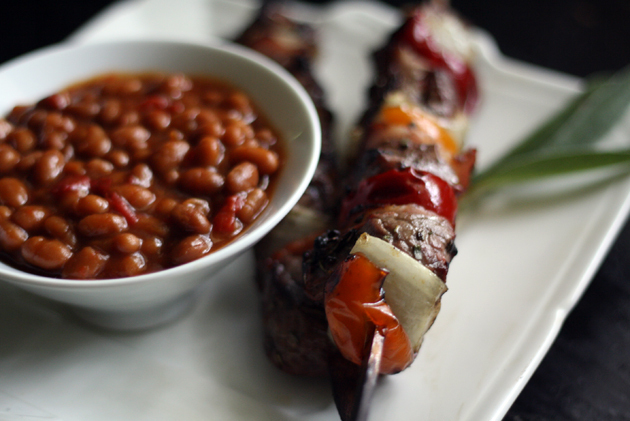 The delicious slow-cooked rich barbecue sauce with pieces of red pepper tucked within the beans was a superb compliment for the sweet & spicy steak kabobs. And it was the perfect way to end my summertime state-of-mind kind of day. If using wooden skewers, soak in water before using. Cut the steak, onions and bacon into 2 inch pieces and the pepperazzi peppers in half. To make the rub for the meat, mix the herbs, paprika and some salt and pepper and toss with the cubes of steak. Then assemble the kabobs. Any order will do, however I strongly suggest that you make sure to place the bacon against the steak for extra flavor. Place the kabobs onto a preheated grill and cook until desired temperature. Make sure to turn the kabobs for even cooking. They are so pretty…I mean mouthwatering gorgeous. I want it for breakfast! I must have them… would you come and grill them for us? That’s the only way to make this dinner easier for me! I love lazy summer days, too. Long, long days to do whatever I please. And I can’t think of anything more welcome at the end of a long, lazy day than these steak kabobs and maybe a little cocktail just for good measure. Love this! A perfect summer meal! Wendy, what amazing looking kebabs–I can almost smell them! And I love me some Grillin’ Beans! What a fun idea to use the pepperazzi peppers! These kabobs are so colorful…and I love how easy they are to put together. These look fabulous! Did you use jarred pepperazzi peppers? I don’t think I’d be able to find fresh anywhere. I agree totally… there is something so relaxing and enjoyable about grilling after a long day (wine in hand of course!) 🙂 These look fab!